The installation focuses on the global food situation and shows where certain kinds of staple foods are grown and used. Staple foods are those that are dominant in global production in order to feed the world. There are over 50,000 edible plants in the world, but only 15 of them account for 90% of global food energy. There are regions where the local staple food accounts for 80% of all consumption. Most plant staple foods are derived either from cereals like wheat, barley, rye and maize, or from rice and starchy tubers, or from root vegetables like potatoes, yams, taro and cassava. Other staple foods include pulses (dried legumes), sago (derived from the pith of the sago palm tree) and fruits like breadfruit and plantains. 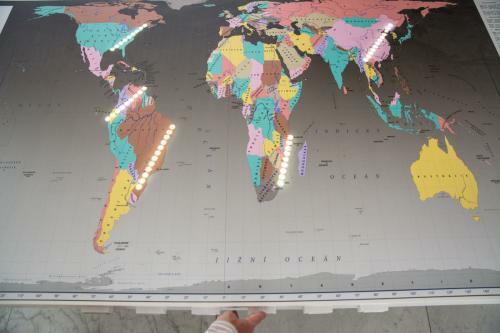 This installation is in the form of an interactive table with a world map (Peters Projection) printed on it. When visitors push the appropriate button, the map highlights the areas where a particular staple food is cultivated. The map is accompanied by facts about food consumption, hunger and food waste around the world. The texts are placed next to the map. The map introduces ten basic staple foods: Maize, Wheat, Rice, Potatoes, Cassava, Soya beans, Sweet Potatoes, Sorghum, Yam and Plantains, and shows the areas where they are grown and the percentage of food consumption that they account for in each region. 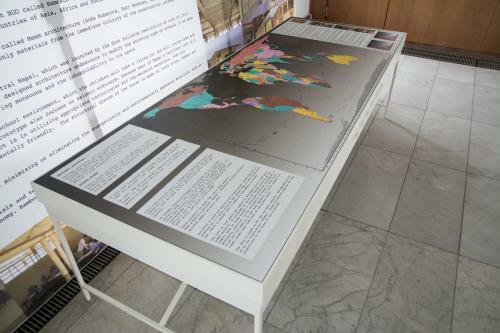 The table with the interactive map is located on the fourth floor of the museum building. This installation is connected mainly to Millennium Development Goal 1 (“Eradicate extreme poverty and hunger”). In the beginning, we had to gather information about staple foods in order to draft the texts. Therefore, we undertook research and then wrote the texts. The texts are placed next to the table for visitors to read. We negotiated with the NGO NaZemi, who gave us the map for free. After that, we searched for someone to make the interactive table and were recommended certain companies by the museum. We came to an agreement with the company, explained our needs and negotiated over the design. The whole production process took about three weeks. The interactive table was installed a few days before the exhibition’s inauguration. It was placed in an exhibition hall on the fourth floor of the museum. The graphic is very nice and elegant. We obtained the map of the world for free from the NGO NaZemi. The map was also used in the installation Gifts of the Sea, which kept the budget very low. The map gives visitors an overview and helps them to visualize the food situation around the world. Many people in the Czech Republic are not familiar with some types of staple foods, so the information is really interesting and new for them. We could have done better with some of the technical aspects, mainly the way that the countries light up. The charts seem almost too technical.